The agoraphobic PlayStation 3 gamer who unsuccessfully sued Sony after his PlayStation Network account was banned has actually appealed the decision and also filed a second civil suit seeking $180,000 in damages. Last week on The Escapist: PS3 owner Erik Estavillo sued SCEA in July after he was banned from the PlayStation Network, claiming the company violated his right to free speech and that as an agoraphobic, Sony had caused him pain and suffering by taking away his only form of socialization. The specifics of his ban are unknown, although it apparently stemmed from "inappropriate behavior." Whatever the cause, a judge dismissed the case in September, saying that PSN isn't "subject to First Amendment obligations." That's not good enough for Estavillo, however. Anyone who expected him to take his lumps and walk away quietly will be surprised to hear that he's still got some fight left in him. Estavillo has filed an appeal of the summary dismissal of his case with the U.S. Court of Appeals for the Ninth Circuit; he's also filed a civil lawsuit against Sony in the Superior Court of California, County of Santa Clara, in which he asks for damages of $180,000. Neither case seems very likely to proceed very far, in no small part because Estavillo is representing himself in both. 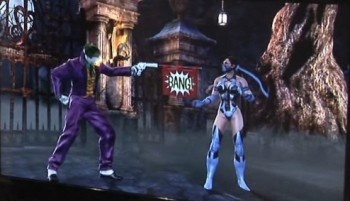 Since his PSN ban he's been playing a lot of Mortal Kombat vs. DC Universe on the Xbox 360 and he told GamePolitics that he's "a bit obsessed" with the character of The Joker. "I plan to wear a purple suit during my court trials," he said. "No joke!"